A Lada Kalina Super 1600, painted in khokhloma national ornaments. Lada is the brand of AvtoVAZ, the largest Russian car manufacturer. Automotive production is a significant industry in Russia, directly employing around 600,000 people or 1% of the country's total workforce. Russia was at Nr 15 of car producing nations in 2010, and accounts for about 2% of the worldwide production. In 2009 the industry produced 599,265 cars, down from 1,469,429 in 2008 due to the global financial crisis, and 1,895,474 vehicles in 2014. The largest companies are light vehicle producers AvtoVAZ and GAZ, while KamAZ is the leading heavy vehicle producer. Eleven foreign carmakers have production operations or are constructing their plants in Russia. The Russian Empire had a long history of progress in the development of machinery. As early as in the eighteenth century Ivan I. Polzunov constructed the first two-cylinder steam engine in the world, while Ivan P. Kulibin created a human-powered vehicle that had a flywheel, a brake, a gearbox, and roller bearings. One of the world's first tracked vehicles was invented by Fyodor A. Blinov in 1877. In 1896, the Yakovlev engine factory and the Freze carriage-manufacturing workshop manufactured the first Russian petrol-engine automobile, the Yakovlev & Freze. 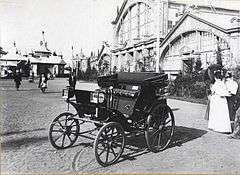 The turn of the nineteenth and twentieth centuries was marked by the invention of the earliest Russian electrocar, nicknamed the “Cuckoo”, which was created by the engineer Hippolyte V. Romanov in 1899. Romanov also constructed a battery-electric omnibus. In the years preceding the 1917 October Revolution, Russia produced a growing number of Russo-Balt, Puzyryov, Lessner, and other vehicles, held its first motor show in 1907 and had car enthusiasts who successfully participated in international motor racing. A Russo-Balt car placed 9th in the Monte Carlo Rally of 1912, despite the extreme winter conditions that threatened the lives of the driver and riding mechanic on their way from Saint Petersburg, 2nd in the San Sebastián Rally and covered more than 15,000 km in Western Europe and Northern Africa in 1913. The driver of the car, Andrei P. Nagel, was personally awarded by Emperor Nicholas II for increasing the prestige of the domestic car brand. In 1916, as part of the government program of building six large automobile manufacturing plants, the Trading House Kuznetsov, Ryabushinsky & Co. established AMO (later renamed to First State Automobile Factory, ZIS, and ZIL), but none of the plants were finished due to the political and economic collapse that followed in 1917. The Soviet Union possessed a large automotive industry. In late 1987, the industry produced 2 million cars, satisfying 45% of the domestic demand. But after the dissolution of the Soviet Union Russian automakers were integrated into a market economy and immediately hit by a crisis due to the loss of financial support, economic turmoil, criminal activities and stiffer competition in the domestic market during the 1990s. Some of them, like AvtoVAZ, turned to cooperation with other companies (such as GM-AvtoVAZ) in order to obtain substantial capital investment and overcome the crisis. By 1993, total output was down 14% compared to 1990 levels. Lada's declining sales during the 1990s, and toughening European Union emissions requirements, saw exports to Western Europe discontinued by the end of the decade. Lada had enjoyed particularly strong sales in Britain, peaking at more than 30,000 sales a year in the late 1980s, but had failed to remain competitive with other budget brands over the subsequent few years. In 1997, the production of cars in the Russian Federation increased by 13.2 percent in comparison with 1996 and achieved 981,000. AvtoVAZ and UAZ extended their output by 8.8 and 52 percent respectively, whereas KamAZ doubled it. The overall truck production in Russia increased by 7 percent, reaching 148,000 in 1997 and 184,000 in 2000. The overall production of cars rose from about 800,000 in 1993 to more than 1.16 million in 2000, or 965,000 (969,235 according to OICA) excluding commercial vehicles. The total numbers of cars and trucks produced in Russia between 2000–2011. The Russian automotive market boomed in 2005–2008. In the early 2000s, the Russian economy recovered. Macroeconomic trends were strong and growing incomes of the population led to a surging demand, and by 2005 the Russian car market was booming. In 2005, 1,446,525 new cars were sold, including 832,200 Russian models and 614,325 foreign ones. Foreign companies started to massively invest in production in Russia: the number of foreign cars produced in the Russian Federation surged from 157,179 in 2005 to 456,500 in 2007. The value of the Russian market grew at a brisk pace: 14% in 2005, 36% in 2006 and 67% in 2007—making it the world's fastest growing automotive market by 2008. Since the 2000s, foreign companies have been flocking to enter Russia, seeing it as a local production location and export powerhouse. Russia's labour, material and energy costs are only 1/6 compared to those in Western Europe. Avtoframos, the third largest car manufacturer, produced 49,500 cars in 2009. 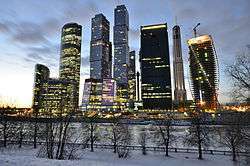 Its plant is located in the south-east part of the city of Moscow. 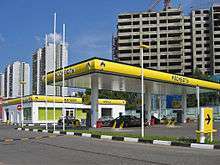 Avtoframos is a joint venture between France's Renault and the Moscow city administration, but is majority owned by Renault. The company manufactures Renault Logan and Renault Sandero models. The ratio of Russian-made parts is 54%. The figure is expected to rise to 74% by 2012. The fourth and fifth largest carmakers in Russia are Volkswagen and Ford, respectively. In total, the five largest companies of the industry account for 80% of all cars made in Russia. Another very important company is GAZ, which makes vans, trucks and busses, among other products. 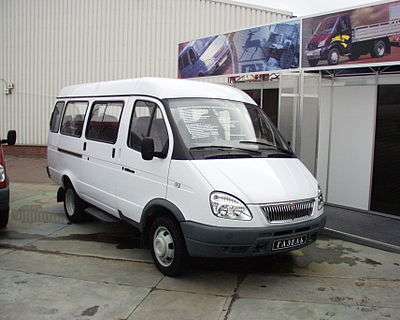 Its most popular product is the GAZelle van, which has a market share of 49% in the light commercial vehicle market. In 2009, the company launched an improved version, called GAZelle Business. In the bus sector, GAZ occupied a market share of 77%. It sold 6,169 buses in the small-class, 1,806 in the medium class and 1,156 in the large class. Russia's automotive industry is a significant economic sector. It directly employs 600,000 people and supports around 2–3 million people in related industries. It is politically a very important part of the country's economy: firstly, due to the large number of employed people and secondly, because many citizens depend on the social services provided by automotive companies. For example, the well-being of the giant AvtoVAZ factory in Tolyatti is massively important to the city or to the region of Samara Oblast. Tolyatti is a typical monotown, a city whose economy is dependent on a single company. The factory employs around 100,000 people of the city's population of 700,000. The Scientific Automobile & Motor Institute (NAMI). Founded in 1920 and located in Moscow, it created the first original Soviet car NAMI-I, which was produced in small numbers by the Spartak State Automobile Factory in Moscow, between 1927 and 1931, and played a key role in the development of most Soviet vehicles. Today it is engaged in the creation of innovative environment-friendly cars, integrated engineering, standardisation and certification. The NAMI Proving Ground (NITsIAMT of NAMI). Founded in 1964, located in Dmitrov. It is the largest specialised research and testing organisation in Russia and Europe that conducts researches in car safety, aerodynamics, vibroacoustics, ergonomics, performs extensive on-road test programs of prototypes and mass-produced vehicles, car systems and vehicle parts in order to make them meet current and future regulatory requirements and improve their characteristics. The proving ground includes a variety of roads with different types of coatings, devices for crash tests, a wind tunnel, a vibroacoustic camera, an engine test bench, and a corrosion chamber. ↑ (Russian) "Andrei Platonovich Nagel (the organiser of the first Russian auto show)". ↑ Scalextric Rally Champions. Vol. I: The interwar period. Altaya. 2008. pp. 20-24. ↑ Begley, Jason; Collis, Clive; Morris, David. "THE RUSSIAN AUTOMOTIVE INDUSTRY AND FOREIGN DIRECT INVESTMENT" (PDF). Applied Research Centre in Sustainable Regeneration. ↑ "AVTOVAZ Joint Stock Company History". ↑ "The post-Soviet automobile industry: first signs of revival)" (PDF). ↑ Vahtra, Peeter; Zashev, Peter (July 2008). "Russian automotive manufacturing sector – an industry snapshot for foreign component manufacturers" (PDF). Turku School of Economics. 1 2 Krkoska, Libor; Spencer, Alan (2008). "Automotive Industry in Russia: Impact of foreign investments in car assembly plants on suppliers' entry" (PDF). European Bank for Reconstruction and Development. ↑ Wielgat, Andrea (2003). "Russian return: investment begins to flow back into the Russian auto industry". Automotive Industries. ↑ Smolchenko, Anna (15 April 2005). "Foreign Automakers Line Up to Enter Russia". The Moscow Times. 1 2 "BASIC INDICATORS OF ORGANISATIONS BY KIND OF ECONOMIC ACTIVITY "MANUFACTURE OF TRANSPORT MEANS AND EQUIPMENT"". Federal Statistics Agency. 2010. ↑ "Car import curbs have Russians on streets". Financial Times. 21 December 2008. ↑ Parfitt, Tom (22 December 2008). "Protesters beaten as anger grows at Russian car import tax". The Guardian. UK. Archived from the original on 14 January 2009. Retrieved 12 January 2009. ↑ "Controversial higher tax on Russian car imports comes into effect". RIA Novosti. 12 January 2009. ↑ "Putin Is Turning Vladivostok into Russia's Pacific Capital" (PDF). Russia Analytical Digest. Institute of History, University of Basel, Basel, Switzerland (82): 9–12. 12 July 2010. 1 2 3 4 5 "Russia's car sector stalls, but foreigners still investing". Russia Beyond the Headlines. 5 June 2010. ↑ "Avtovaz in profit thanks to Russia car scrappage scheme". BBC News. 12 June 2010. ↑ Rozhnov, Konstantin (7 March 2010). "What will save the Russian car industry?". BBC News. 1 2 "Car production reaches pre-crisis level". Voice of Russia. 13 December 2010. 1 2 "Prime Minister Vladimir Putin is confident that the automotive industry in Russia's Far East has a future". Premier.gov.ru. 7 December 2010. ↑ "Car production clicks into top gear". Russia Today. 13 August 2010. ↑ "Russia gaining the importance in the world car industry". Autostat Analytic Agency. 17 February 2011. ↑ "Emerging Trends and Future Prospects in Russian Automotive Industry". Growth Consulting. ↑ "Самые популярные автомобили в России за 10 месяцев 2009 года". NEWSru.com. 1 2 "GAZ Group Annual Report 2009". GAZ Group. 2010. ↑ "Renault says Avtoframos '10 output up 70% to 87,600 vehicles". RIA Novosti. 25 January 2011. ↑ "KAMAZ in January". KaMAZ. January 2011. ↑ "From Lada the Car to Winnie the Pooh". Russia Today. 16 November 2009. 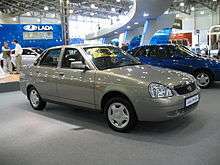 ↑ Putin’s Lada Kalina Sport | Image galleries | RIA Novosti. En.rian.ru. Retrieved on 23 February 2011. ↑ Vladimir Putin travels by Lada Kalina | Video | RIA Novosti. En.rian.ru. Retrieved on 23 February 2011. ↑ Russian PM hits freshly-built highway in a nationally-made car – RT. Rt.com. Retrieved on 23 February 2011. ↑ (Russian) "NAMI official site". ↑ (Russian) "NAMI Proving Ground official site". ↑ "Russian buys 'significant' stake in Virgin". TheF1Times.com. Archived from the original on 12 November 2010. Retrieved 11 November 2010. ↑ Formula One. "Marussia ceases trading and makes all 200 staff redundant". Telegraph. Retrieved 2015-12-24. ↑ Kramer, Andrew E. (13 December 2010). "Russian Billionaire Backs New Hybrid Car". The New York Times. Retrieved 14 December 2010. ↑ Popova, Nadia (14 December 2010). 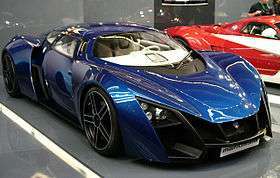 "Russian Billionaire Ventures Into Hybrid Cars". The Wall Street Journal. Retrieved 14 December 2010. ↑ 08.04.2014. "One of Russia's wealthiest men sells Yo-Mobile project for 1 euro - PravdaReport". English.pravda.ru. Retrieved 2015-12-24.